PICLS is a thermal simulation tool which helps designers easily perform thermal simulation of PCBs. 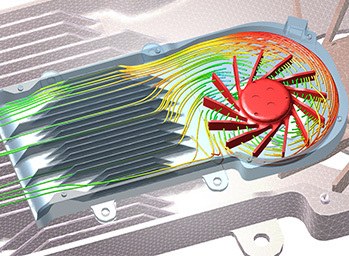 Even if you are unfamiliar with thermal simulation, you will obtain a simulation result without stress through the tool’s easy and quick operation in 2D. You can import the data of a PCB created in PICLS to scSTREAM and HeatDesigner, that is, you can pass the analysis data seamlessly from the PCB design stage to the mechanical design stage. There have been rising demands for smaller, more tightly sealed and quieter electronic devices. To meet the demands, thermal design of the whole devices has become insufficient and thermal design of components such as PCBs is now vital. Software Cradle’s PICLS is designed to minimize the tasks on design engineers in early development phase, which is imperative for front loading. 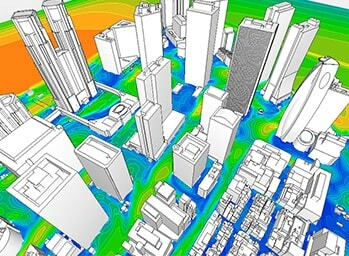 Using this tool, design engineers can perform thermal analyses of PCBs even during conceptual phase of the development. PICLS is available through the Altair Partner Alliance. As analyses become more complicated and advanced, longer time is required to calculate. This is why analysts often fail to provide analysis results that meet the design engineers’ requirements in a short amount of time. PICLS can solve this problem by limiting the operations to upstream design. 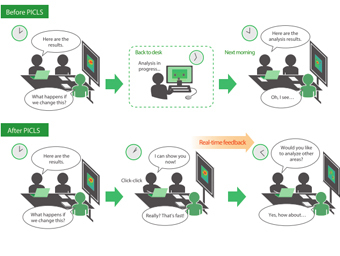 One click and analysis results can be generated real-time. 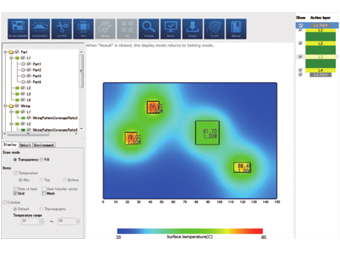 It helps discussions between engineers and PCB evaluations during design reviews as it enables users to undertake thermal analyses on the spot. In order to achieve front loading, it is important to effectively apply evaluation results from upstream design process to downstream design process. After the evaluation using PICLS, PCB data can be passed onto a system level thermal fluid analysis tool that is used during mechanism design process. PICLS can be used for thermal simulation of PCBs in any industry which designs circuit boards including: aerospace, automotive & ground transportation, biomedical, consumer goods, electronics and energy. After the evaluation using PICLS, PCB data can be passed onto a system level thermal fluid analysis tool that is used during mechanism design process. You can import the data of a PCB created in PICLS to scSTREAM, that is, you can pass the analysis data seamlessly from the PCB design stage to the mechanical design stage.